This entry was posted on Tuesday, July 20th, 2010 at 12:30 am and is filed under FPB 64 Sea Trials. Both comments and pings are currently closed. “Dive, Dive, prepare for deep submergence.” Just in case you wanted a caption for this photo. Even a submariner would be impressed. I have just reread “Pitching in headseas” (on the FPB site) and it seems to me that there is a substantial difference of pitching levels between the 83 and the 64. Do you have any quantifiable info or comments to make? Both designs behave as expected. The 64 has a little more pitch but a softer landing than the 83. Both boats slice through the waves. Pitching occurs only rarely and typically in new waves. 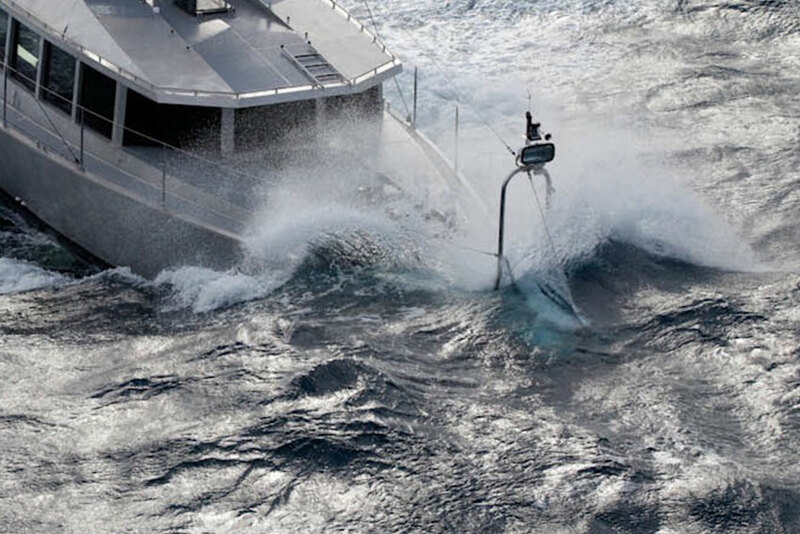 In the open ocean, and longer, mature waves, motion is quite subdued on both compared to other motor yachts. And that’s not just our opinion (see the magazine reprints for editorial comments). We’ll have some video up after we return from sea trials end of March. Speaking of which, there is a video comparison now under the FPB 64 category, or you can click here. Can’t wait to see the 112 sea trial videos. The FPB’s get my vote as the best boats built in mankind’s history. I might argue in favor of the extreme clipper ships from Donald McKay, but then they had somewhat larger crews who were probably a bit tougher than us!